November is the time of year when you may find yourself in need of some extra seating. It could be a holiday party, extra family and friends in town visiting or maybe you are hosting the holiday dinner this year. Whatever the reason may be, you will need some extra seating. This seating should be stylish, fit with your décor, and be something your guests actually want to sit on. It may be time to invest in some quality folding chairs to keep on hand for when life needs them. 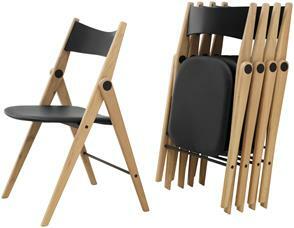 We have selected the Oslo Folding Chair from BoConcept. This chair is made of solid oak construction with black, leather look upholstery. The chairs that BoConcept offers do come in a variety of materials, finishes, and upholstery options so you are sure to find one that suites your style. We love this chair for its quality, its updated modern style, and it’s easy to maintain, wipe clean, and fold it back up ease of use. Then it can be stacked together and tucked away neatly into storage till you need them again.